In RESTful (JAX-RS) web services @PathParam annotation will be used to bind RESTful URL parameter values to the method arguments. Lets discuss with a simple example. If you are new to RESTful web services or if you would like to know complete step by step flow of JAX-RS, Go through this article ‘Jersey Hello World example With Maven in Eclipse Juno‘, then only you will be able to understand this tutorial 🙂 and even further web services tutorials. 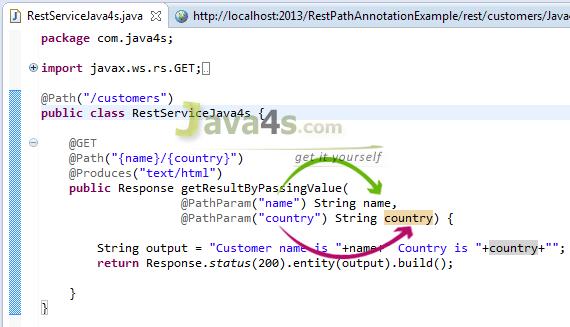 Once you hit the URL, http://localhost:2013/……/rest/../Java4s/USA , last two parameters in this URL ‘Java4s‘ and ‘USA‘ are retrieved by @PathParam(“name”), @PathParam(“country”) annotations in RestServicePathParamJava4s.java and will copy into String name, String country respectively. Can you please explain me the use of init-param here? The values you have provided under param-name and param-value tags, I can’t understand. init-param means we are registering our resource into implementation vendor ,if you not provide your init-param it will scan the package. Sivateja Kandula Your Really Done WonderFull Job And Keep It Up..! this is vijay, please help me . i want to send JSON data as request to REST web service and want to store JSON element to data base and response to client as successful read json elements. Nice and superb explanation !!!!!!!!!! !